But OWS was always better understood in the context of history than in the context of American politics—the entire premise of the movement was that American politics were fundamentally broken in the first place. 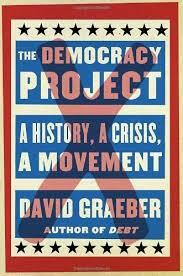 David Graeber’s new book, The Democracy Project: A History, A Crisis, A Movement aims to place OWS in that historical context. It’s something of a tricky task, since the movement is only two years old, and its long-term effects are still unclear. In this respect, Graeber’s book calls to mind The Eighteenth Brumaire of Louis Napoleon, in which Karl Marx tried to place the rise of Louis Bonaparte in the larger context of the socialist movement. Like Marx, Graeber is commenting on a social movement almost while it is unfolding, while also trying to see it through centuries of history. Unlike Marx, Graeber doesn’t have a single view of history to which all events must comport—The Democracy Project offers no modern version of dialectical materialism. In some ways, this makes the book less coherent, but also more accepting of the oddities of history; Graeber’s book pays close attention to the impact of little things. Much of the book is dedicated to ways in which protest movements are traditionally marginalized, and why those things didn’t work against OWS. For example, Graeber talks about the way protest movements are often penned into preordained “Free Speech Zones” with steel guards as a way of making protest seem simultaneously permissible and pointless. Small things about OWS, like the tents in the park, helped it grow as much as any political philosophy did. Graeber, an anthropologist at Goldsmiths, University of London and author of 2011’s Debt: The First 5,000 Years, has a unique perspective to examine OWS, as he was present during its early days. Part of his book is essentially a memoir of the events leading to the encampment at Zuccotti Park, and these sections read like an Inside Baseball account of New York City’s activist movement, with all the infighting and politics that goes on behind the scenes. There is an alphabet soup of organizations—the WWP, the IAC, the ISO—that all have their own leadership structures, their own levels of acceptable radicalism, and their own rivalries. Each group is eager to take credit and control of any protest it feels will get some attention. Of course, this is precisely what turns so many people away from activism. When Graeber and other activists arrived at an originally planned “General Assembly” on August 2, 2011, they were disappointed to find a strictly organized protest: “The organizers’ idea of an ‘assembly’ seemed to be an open mic, where anyone in the audience had a few minutes to express their general political position or thoughts about some particular issue before we set off on the preordained march.” Graeber speaks very dismissively of activist groups whose ideas of activism consist of “marching around with signs.” It was only when a few activists broke off and began their own General Assembly, under more horizontal principles, that the movement really took off. *Something else Graeber shares with Marx is a keen eye for the way terms are used. Given this history, though, it’s not clear why Graeber even bothers with the term “democracy” at all. Like so many other terms, it seems more or less lost to history, and its use is only likely to confuse people. It’s true that none of the other terms Graeber uses—“horizontal,” “small-a anarchists,” etc.—have the romantic cache that the word “democracy” has, but the latter term is so loaded that it’s more of a distraction than anything else. Graeber describes how people used to the conventional forms of democracy had difficulty adjusting to the processes at OWS. People familiar with majority votes weren’t used to working in a consensus model, in which even minority viewpoints have to be considered and addressed. Similarly, people had to be taught that a “block” is not the same as voting “no,” and should only be used as a last resort. None of these are features of what we’ve come to know as “democracy,” and a new term might help prepare people for the differences. Some of the book’s most profound insights come on the topic of violence. Part of the success of OWS, Graeber contends, is that it exposed how much of the current political system is built simply on the use of force. Many of the most memorable images of the movement were of the police pepper-spraying peaceful protestors. What was unusual wasn’t the level of violence on the part of the police—Graeber assures the reader that this is to be expected at any protest—but that the media actually paid attention to it. Normally, he contends, the media simply define “violence” as “the unauthorized use of force”—something the police are, by definition, never guilty of. But Graeber cites various reasons, like the abundant evidence of abuse on social media and the similarities to the Arab Spring, that sources couldn’t take the same authoritarian perspective on OWS. Thinking about this more generally, Graeber delves deeper into what this says about cultural attitudes towards violence. While massive acts of violence committed by the police or the government are almost always accepted as necessary, even the faintest hint of violence on the part of protestors is often enough to condemn the entire cause. * Exposing this double-standard is one of the many ways that OWS succeeding in exposing the moral hypocrisy of the state. This type of success may not satisfy everyone. It is, after all, very hard to gauge things like the state’s level of exposed hypocrisy. But it would be silly dismiss the effects of these things simply because they are hard to measure. In retrospect, of course, we understand the impact something like Uncle Tom’s Cabin had on the abolition movement. Graeber makes a persuasive case that OWS succeeded on the same level. Making this case, of course, means making the case against the system of “democracy” that OWS was protesting. Graeber does this by placing what he calls “mafia capitalism” in the context of centuries of history. Like he did in Debt, Graeber jumps through history to identify the way certain features of American life—like, say, the student loan industry—are really just modern incarnations of historical systems of servitude. Sometimes he moves through history with haphazard restlessness—and he seems at times too dismissive of economic arguments—but he’s always enlightening and clever, and often slyly funny. By the end, even a reader less inclined to embrace his style of anarchism will have a new view of the historical role OWS plays.